It is a funny thing about growing up. Your relatives are around when you are born, so you accept their presence for the rest of your life – just like you accept the tree in your front yard. They’re just there. Until they are not. 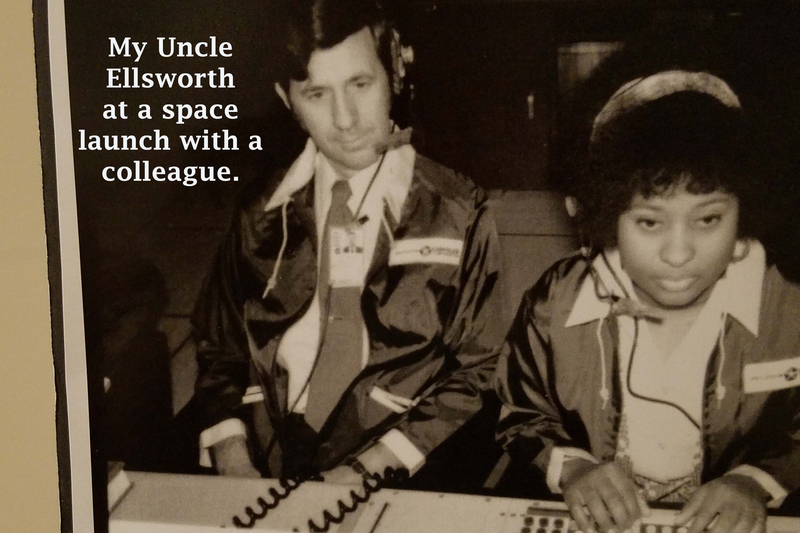 Our rocket man was my Uncle Ellsworth Brunais, an engineer for NASA and Chrysler, who led the way in BEING inclusive rather than talking about it. Ell had a brain that offered both immense IQ and EQ – a rare combination for someone in the field of STEM. He was an engineer with a warm heart. Smart but not stiff. When I attended his funeral, I learned things about him I’d never known (I encourage you to scroll down though the photos even if you don’t read the text). What a pity I was unaware of many of his accomplishments – yet Uncle Ell was the last person in the world to blow his own horn. Uncle Ell was distinguished looking! I’ve taken to walking every morning so that my brain receives its daily dose of Vitamin T – Thinking Time. It’s a way of honoring what I do best (noodle & problem solve) AND put the brakes on something I struggle with (working myself to death from dawn ‘til dusk). On Saturday, July 28th, I headed out on my usual trek. The sun was just barely making its presence known. When I hit 12 Mile (those of you who know 8 Mile from Eminem – I live near 12 Mile, which as math would have it, is four miles north of where Mr. Eminem lived.) Anyhow, when I hit 12 Mile, I glanced to my right and saw the most glorious full moon making its way toward the western horizon. I wished I had my cell phone so that I could capture it and show it to my family. Ell was being buried in just a few hours, and there something lovely about him being welcomed into heaven with a celestial celebration in the sky. Ell was a rocket scientist. He worked for NASA and built rockets for the Saturn program. Then he worked for Chrysler (they made rockets back in day!) and that’s where he spent the rest of his career. There is a lot I don’t know about him from that time because I was little. When we are little, we don’t care about such details as what adults do for a living. The Launch Team. Uncle Ell is on the right. What we do care about is being treated with kindness, and we like adults that are funny. Somewhere I have a video of Ell and my Dad (who passed away when I was 11, so the video is probably from when I’m 9 or 10). There’s no sound – it’s a silent movie. My dad and Uncle Ell are wearing women’s wigs and fencing with plastic swords. I believe their goal was to look like the 3 Musketeers, showing off their flowing hair and blazing speed with a weapon. Instead, they looked like large men wearing women’s wigs dancing around and poking at one another like fools. That’s the kind of thing kids like, right? Right. He and my Aunt Jackie lived near Cape Canaveral in Florida for some years, so my family often took the proverbial 2-day trip in the back of a station wagon to visit them on vacation and swim in the ocean. I remember body surfing, sea shells, and dolphins. They had kids older and younger than me, so there was plenty of activity. Naturally, when I grew up and went off to college and work, I saw less of them. There were occasional family get togethers, and Ell was always there, a tall, thin man with an easy smile and gentle way of asking about my life. He was a good listener. This may sound a bit morbid, but some of my favorite Uncle Ell memories come from funerals. I remember the first time I got a thrill of delight when, as I approached him at a funeral home, I realized that Ell had donned his engineer’s pocket protector, complete with a full set of colorful pens. My delight only increased when, as I leaned in to view it more closely, I realized there was a protractor in there, too! Who brings a protractor to a funeral home? I asked him, and he didn’t explain. He just gave that gentle, almost silent laugh of his. He didn’t leave home without his tools. It’d be like a carpenter wearing his toolbelt to a funeral. Odd, and entertaining. Every funeral we attended after that, Ell and I would have a good laugh. Protractor and pen protector were always present. He graduated from U of Michigan. Fast forward a bazillion years. I last saw Uncle Ell at his 90th birthday a year ago in June. He was shorter, very frail, and just as warm and kindly as ever. He said he had read my book, Destination Unstoppable, and he liked it very much. I got a chuckle out of that. I heard that Uncle Ell was ill a few weeks ago. He was moving from hospital to nursing home and back again. I had just asked my Mom where he was so I could see him. He passed away the next morning. Ell didn’t go without making a final impact on the medical community. Mind you, when he entered the hospital, he only had 15% heart function. He could hardly walk and he wasn’t eating. However, whatever medication they put him on did something. When the staff returned the next morning, Ell had apparently worked all night. He had completely taken apart his bed and was moving on to the bed next to him (which was occupied). How one accomplishes all that with only 15% heart function and a weak, failing body is beyond me. My Mom saw him a few days before he passed away. Now 91 years old, Ell announced that he wanted a smart phone – his flip phone was too hard to use (and smart phones are so easy!) He asked for a piece of paper and a pen. They gave him one, and he wrote down some sort of engineering formula, and handed it back to them. Shortly after that, Ell fell into a deep sleep, and never woke up. I went to the visitation. His children had done a great job of showing the life of Uncle Ell – a life I didn’t know all that much about. I took the photos shared here so that I could remember and appreciate him more fully. During the Catholic mass, I noticed that when people went up for communion and passed near Uncle Ell’s casket, the flames on the candles seemed to curtsy and nod in recognition. When I left the church, the full moon was gone, and so was my Uncle Ell. Aww, thank you, Vicki! I was lucky to have him in my life. I was glad to be there – his wife, Jackie, passed away when I was living in Savannah and I missed her funeral. They were both remarkable and very good to me. Thanks again!